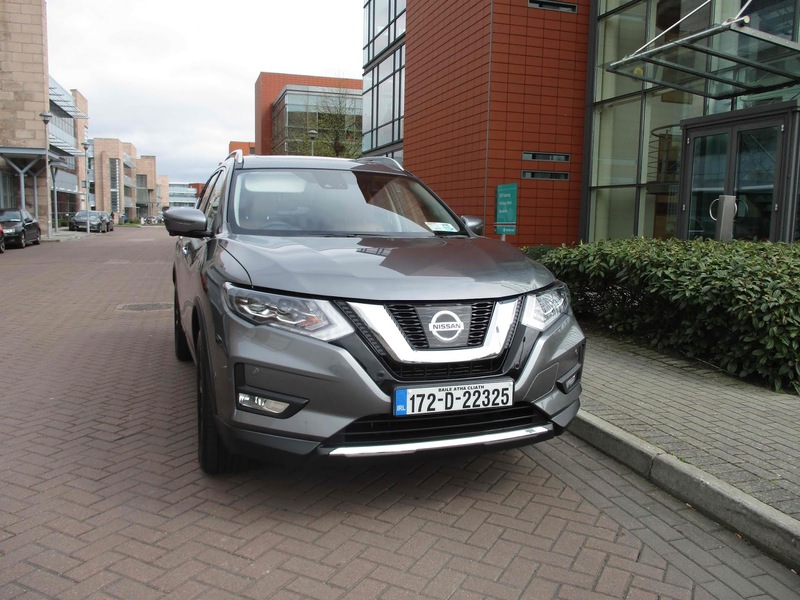 Nissan's X-Trail 7-seat family car proved its ability as a 'home from home' on wheels when I had extended family here from abroad for a wedding in Cork, writes Trish Whelan. The gang in my car included four young people ranging in age from nine to 'almost 14' and two adults. With six seats in use, the second very rear one was kept flat for more luggage space - cases, shoes, bags and anoraks. All the important stuff. The youngsters loved this car which transported us with such ease and comfort for almost half the length of the country, and a lot of to-ing and fro-ing in the Cork area over the wedding days. In the Nissan SUV model line-up, X-Trail stands above Qashqai. This was the upgraded version of the company's flagship crossover, and best-selling model worldwide, which went on sale last November. Enhancements focused on a fresh exterior design, a higher-quality interior with new features, more practicality, and new technologies to make life on the road safer. Changes include a wider grille with more impact, new headlamp clusters, front fogs integrated into the new front bumper, and a stronger rear bumper with new chrome detailing as well as new chrome moulding across the bottoms of the two side doors. The cabin offers very good space including very good knee room in the middle row. Seats slide and recline. The 11-year-old had opted for the sixth seat and chose to get in and out via the 'trunk' (only when an adult was outside the car to assist). These seats are really just for children. Two sunroofs covered the entire length of the roof. The front one tilts open. Boot space on 7-seater X-Trails is still a good 445 litres, expandable to 1,996 litres with all seats folded flat. You can adjust boot shelves to suit your load and there's a hidden area to keep valuables out of sight. Getting all the cases and bags in and out proved a doddle. Grades are XE, SV, SVE, and SV Premium. 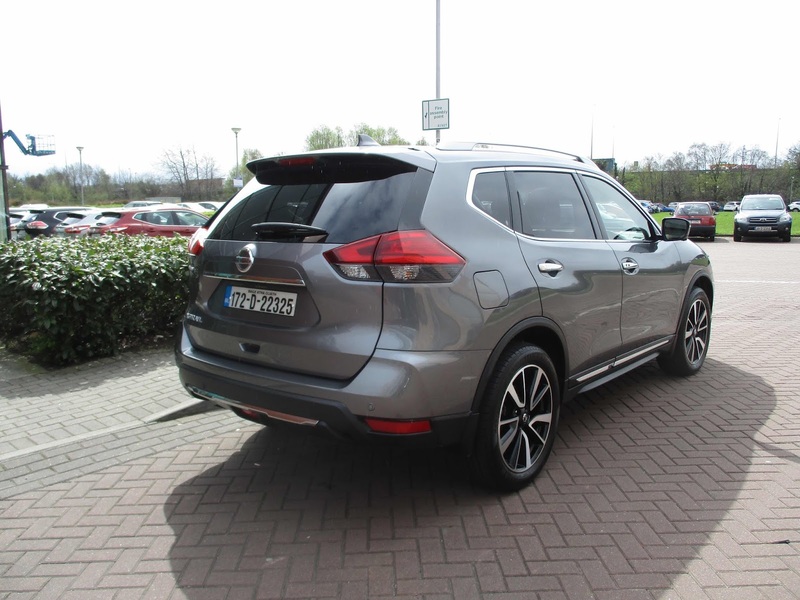 The entry model has front and rear parking sensors, chassis control, 5-inch colour screen, cruise control with speed limiter, Bluetooth, air conditioning, 17-inch alloys, and, essential for a family car, a spare wheel. 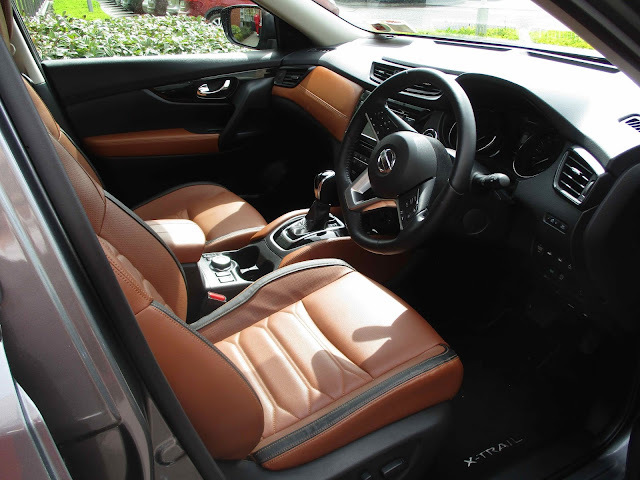 The top SVE adds among other things, leather heated front seats and steering wheel, 19-inch alloys, auto leveller, LED headlamps, dual zone air con, and all around view monitor as well as power operated front seats. Technologies include rear Cross Traffic Alert (for when reversing out of a parking space), and emergency braking updated with pedestrian recognition. Customers can choose between petrol or diesel, six-speed manual or CVT automatic transmissions, and two or four-wheel drive. The petrol is a 1.6 with 163hp with a starting price of €36,600. Diesels are a 1.6 and the new 2.0 177hp. Those three attract an annual road tax of €390, while it becomes a hefty €570 for the SVE 4x4 CVT automatic 7-seater. This was the review car which had the option of attractive tan leather upholstery bringing the price to €52,700. This engine, even with six on board and their luggage, coped very well with lots of power and torque both on main roads and in slow moving traffic. The Around View monitor proved really useful when parking in a tight area near the sea front in the historic town of Cobh on our travels. All in all, for us the perfect car for a family adventure.